When you have a case of boring desk syndrome take a look at Studio Sweet & Sour Stationery. 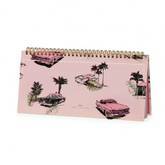 The Dutch brand know how to add style with this pink cadillac print on a hard cover spiral desk planner. 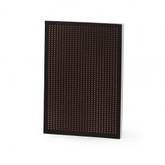 Sits up to display undated calendar pages on one side and grid notes section on the other. Always adding playfulness to functionality Studio Sweet & Sour have a great selection of accessories. 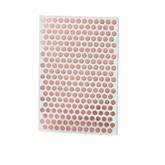 This glossy copper square make up bag comes complete with branded puller, metal zipper and spotted cotton lining. The Dutch brand have achieved a handy bag to carry all cosmetics but can also be used as a pencil case. Knowing that pencils can be drab and not very exciting, the team at Studio Sweet & Sour revamped the common pencil. 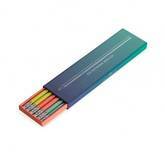 6 pencils in pastel shade beautifully presented in a rich ombre box, each stamped with a motivational quote. Chic contemporary copper debossed notebook. 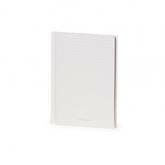 Soft cover with patterned inner pages. Continuing the black marble trend and combining functionality, Studio Sweet & Sour deliver this amazing make up bag that can double as a pencil case. Amazing black and white patterned canvas make this bag super durable and easy to clean. 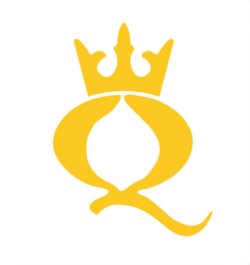 The gold metal zipper opens the bag out to a black cotton lining so you can keep all your essentials clean and safe. Dutch brand Studio Sweet & Sour present the Basic Chic collection with black, white and copper details. This A5 black flexible notebook with grid detail front cover is a classic jotter with a unique twist. Inner pages have unique cross grid markings which are perfect for jotting down notes or creating bullet journals. Always leading the way with design trends, Studio Sweet & Sour present this amazing all over copper notebook. This A5 number has copper cover, metallic edge trim and black foil details "THINGS". 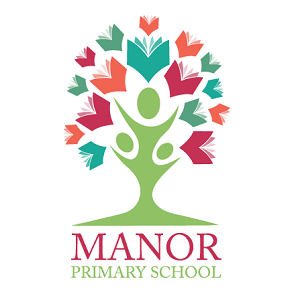 It's no wonder this is our best seller! 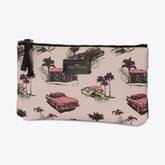 Dutch designers Studio Sweet & Sour have created a brand new velvet make up bag that is hot to trot! In beautiful blush pink this velvet bag is great for holding your make up accessories or even popping in your favourite stationery to use as a pencil case. A gold metal zip and black lining completes the luxe look to this velvet beauty. Sticky notes have never looked so good with Studio Sweet & Sour's marble memo pad. 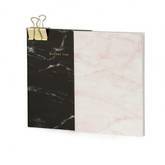 Combining soft pink, black marble and gold foil details brings a whole new meaning to taking notes. Four different styles of inner pages to keep things looking fresh! Gold foil "STICK WITH ME"
This A6 notebook comes from brand Studio Sweet & Sour. The hardcover makes for a durable notebook and the debossing detail adds an interesting factor. Copper foil detail of "TAKE NOTE" as well as copper end paper and inner pages are grid paper. Studio Sweet & Sour are renowned for creating stationery with a difference and this set of 3 is no exception. 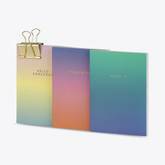 The set includes three A6 jotter notebooks with varying inner pages to suit any job. Comes complete with paperclamp so as to keep all of them together or use it elsewhere. Gold foil lettering on each "HELLO GORGEOUS", "TAKE NOTE" and "WORK IT"
Keeping bang on trend these Studio Sweet & Sour notebooks with contemporary marbling print. Blush pink hue contrast the black perfectly to create an aesthetically pleasing set of notebooks. Each come foil stamped "BUCKET LIST" and "NOTE IT" with lined paper inside. With their new retro inspired print, Studio Sweet & Sour have vividly captured the essence of LA in the 50's. Made from Saffiano style material, which is wipe clean and durable, this make up bag keeps all your cosmetics to hand and fits perfectly in your chosen handbag. Can double up as a pencil case too.